I'm a firm believer that everyone deserves to smile, shine and sparkle, and if you know me, you know it's the little things that make my heart sing. Thankfully, I've raised two girls who think the same way that I do, finding joy in the little things. And if those little things shine and sparkle, all the better! That's why us Mahoney girls have been pretty excited about the latest trend in accessories: StickerBeans™! When I was a kid, sticker collecting was all the rage. It was fun to hunt down cool stickers and trade for new ones with your friends. I had tons of sticker albums filled with my favorite designs. Sadly, times have changed and sticker books aren't as cool as what they once were. Two Moms, Dana Runyon and Kim Spadaccini also shared in my love of sticker collecting, and wanting to bring back the fun and excitement of the hobby, came up with the idea of StickerBeans™. Gone are the days of putting your favorite stickers in a book only to be seen when you get the urge to flip through the pages of the album. 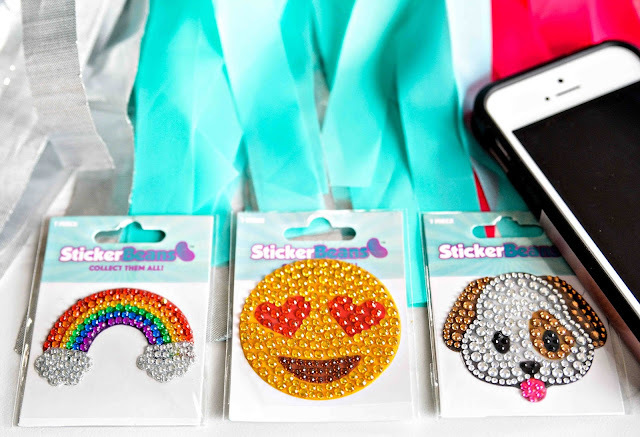 Now, you can add trendy and sparkly stickers to your accessories and show them off wherever you go. 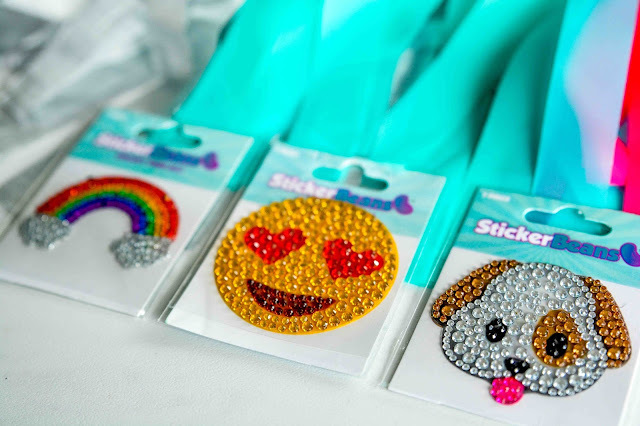 StickerBeans™ stickers are made from sparkly rhinestones that add a little glitter and glitz to every day items. 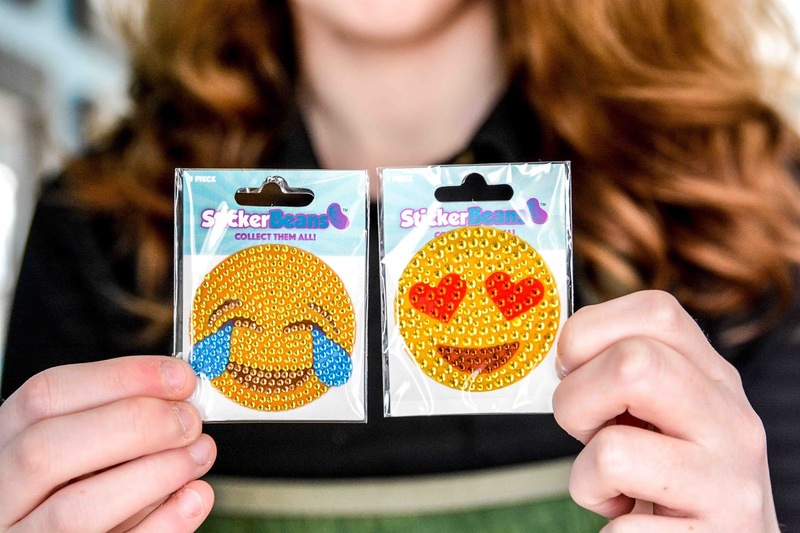 Pop them on phone and tablet cases, laptops, lockers, notebooks, pencil boxes... almost anything your little heart desires for a fun fashion statement. 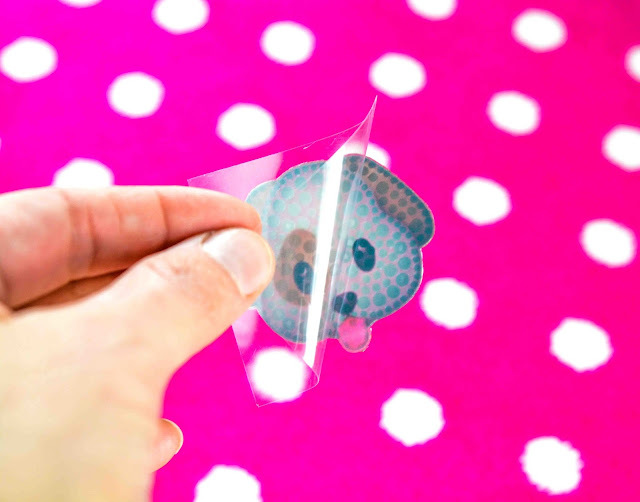 Easily peel the sticker from the plastic backing, then stick your StickerBeans™ to anything that needs a little sparkle and shine. Allison was pretty excited to see these come in the mail and couldn't wait to immediately add the puppy dog StickerBeans™ to her cell phone. She then started piecing out which ones she wanted to share with her friends so she could add a little sparkle to their day too! 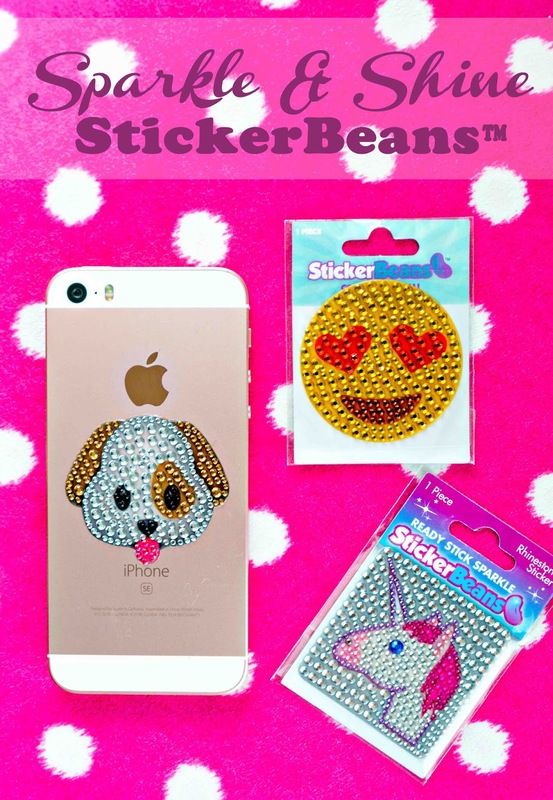 StickerBeans™ come in a variety of sizes, 2-inch, 5-inch, and 2-feet, so you can bling out anything from phone cases to walls. Prices start at $3.50, which I think is an inexpensive way to add a little flair to your favorite things. 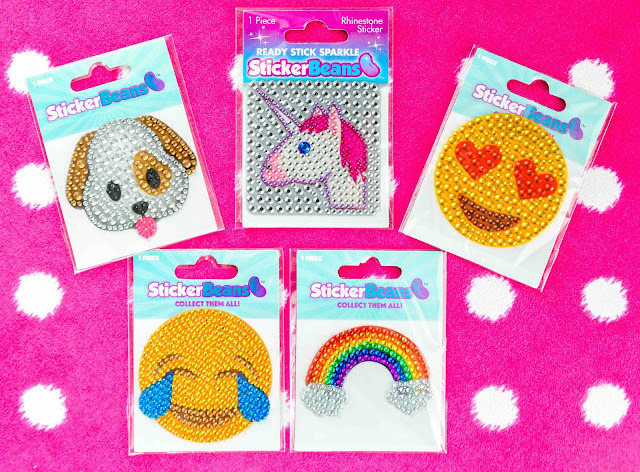 There are oodles of designs available, from donuts and cupcakes to emojis and nail polish and unicorns, and with the line constantly expanding, there's something for everyone. They are fun to collect and share with friends, and with Easter right around the corner, StickerBeans™ would make an awesome, inexpensive basket filler! To find out more and to purchase your own, be sure to visit StickerBeans™ today! What design do you thing would make for a fun rhinestone sticker? Those are so cute! So perfect for your girls. I'd like to have a hedgehog sparkle sticker. A hedgehog would be so fun! Now I have to go see if they have that one. I think I'd like a boxer. Wonder Woman would be fun too! You can never go wrong with bright colors! The little things are what truly matter indeed, can't beat a little added sparkle in ones life. Jason always tells me how lucky he is. Don't give me expensive jewelry. I'll take some $3 rhinestone stickers over that stuff any day! I had albums and albums full of stickers when I was a kid. These are so cool! I think a pig face would be fun but love the puppy one you showed also. Pigs for the win! Gotta love a sparkly piggy! OMG, I'm in love. I am a grown woman, BUT I am seriously considering decking out everything I own with these. They look awesome! Ahhhh! That is so cool! I must have these! I love fun, festive bling. So great! Stickers were my life growing up, yes I still have my sticker book that has the stickers not stuck on so they are still usable. Getting back to sticker beans my daughter will love this for her phone to show some individuality. I will go with puppy as well, Theresa! So cute indeed...my daughter will definitely love these! These are so fun. I could see myself sticking some on an old phone case to jazz it up. This is so cute! What a great way to make an old phone look cuter! What a fun way to add a personal touch to your stuff! I think these are perfect for personalizing school supplies! If something like this had been around when my daughter was young, then our whole house would have been wallpapered in stickers. We both love stickers. Oh wow! These are so cool! My daughter will surely love this! I don't think stickers will ever go out of style with the kids! These are so adorable. I know my Daughter is going to love them. I will have to get her a few to use. Those are so much fun. I know my glitter loving daughter would have a blast adding the. To all of her stuff. I love sparkly things ans stickers. This is just perfect for my journals! These are absolutely adorable! I know my daughter would love to have one of these on her phone! Such cute and sparkly designs.. Lil Pumpkin will love them! I really like the Unicorn myself! These are so cool! I want to get a few of the emoji ones to put on the back of my new laptop! I think these emoji stickers are cute. I think a teen would really enjoy these!